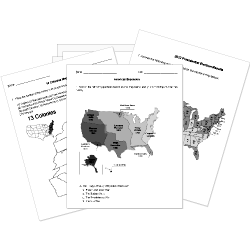 You can create printable tests and worksheets from these Grade 8 Modern Era questions! Select one or more questions using the checkboxes above each question. Then click the add selected questions to a test button before moving to another page. What type of jazz was dominate in the 1930s? What work by George Gershwin helped to bring jazz into the mainstream? A mixture of jazz and rock developed in the 1960s that was called what? What band is credited as having the first Jazz record released? In 2009 which musician became the first African American to appear by himself on a United States circulating coin? What was the first Jazz piece to be printed? What was the term used for people who refused to go fight in the Vietnam War and many ran off to Canada? Jazz is traditionally thought to have originated in which city? According to what Cold War philosophy did the United States believe that, if Vietnam fell to communism, all of southeastern Asia would fall to communism? Who was the Republican presidential candidate for the 1952 election? Why are names still being added to the Vietnam Wall? How are names arranged on the Vietnam Wall? Who was the first known casualty of the Vietnam War? What happens to the tributes that are left by the Vietnam Wall? How did the radio help unify American culture? How did electricity change American life and business? Impeachment charges were brought against President Clinton. What are the dots on the Vietnam Wall panels for? Fort Astoria was the first permanent American outpost on the Pacific coast. To cut costs, the U.S. Postal Service plans to end Saturday mail delivery this summer.